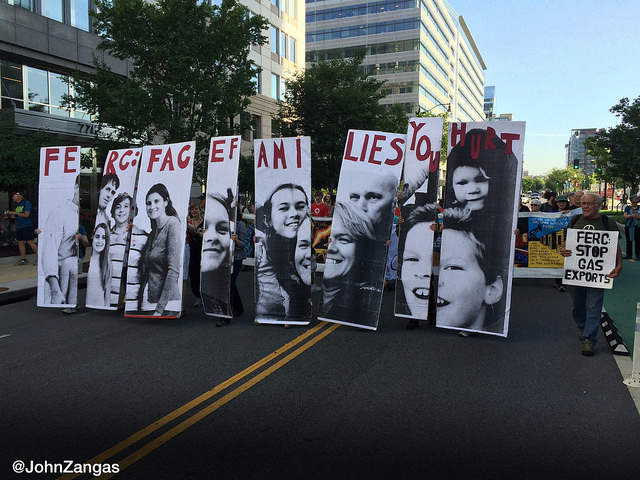 1st Street, Washington DC | May 26, 2015 – Led by frontline community members from New York State, Maryland, Western Pennsylvania and many more, protestors held a rally and shut down a major traffic hub in downtown Washington, DC to protest the Federal Energy Regulatory Commission (FERC). 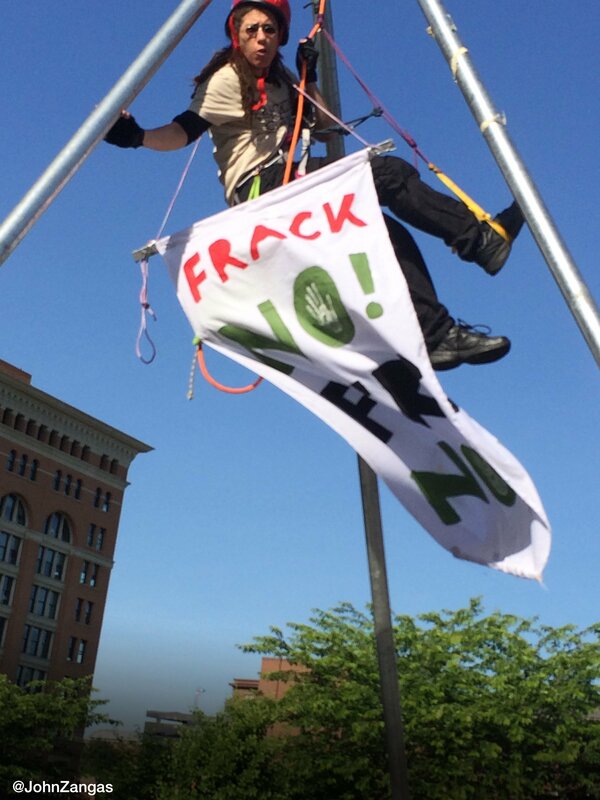 Organizers said they were there to protest the agency that is directly responsible for permitting and approving numerous fracked gas pipelines, compressor stations and import/export LNG facilities from coast to coast. Roughly 100 protestors assembled and blocked the entrances to the Federal Energy Regulatory Commission using giant images of the families impacted by FERC approved projects, and set up a 18 ft. tall tripod in the middle of North Capitol Street around the corner from the FERC headquarters, which stayed up (with an activist suspended inside) for over an hour, blocking traffic and holding an impromptu teach-in about fracking’s impacts in the middle of the avenue. This disruption provided time, space, and a platform from which the stories of five of our front-line community family members were able to be delivered; Tracey Eno from Maryland, Hattie Nestel from Massachusetts/New Hampshire; Heidi Cochran from Virginia, Maggie Henry from Pennsylvania, and Faith Meckley from New York State. These resistance leaders and community safety, health, and rights defenders represent various phases of fracked gas industry exploitation and systematic #communicide: fracking wells, transmission infrastructure (pipelines/compressor stations), storage facilities, and export terminals for liquefied natural gas (LNG). Police blocked off the area but there were no arrests. Today’s actions were planned by Beyond Extreme Energy, a nationwide coalition of front-line communities — and their allies — who are fighting proposed and existing fracked gas pipelines, wells, compressor stations, LNG and storage facilities. 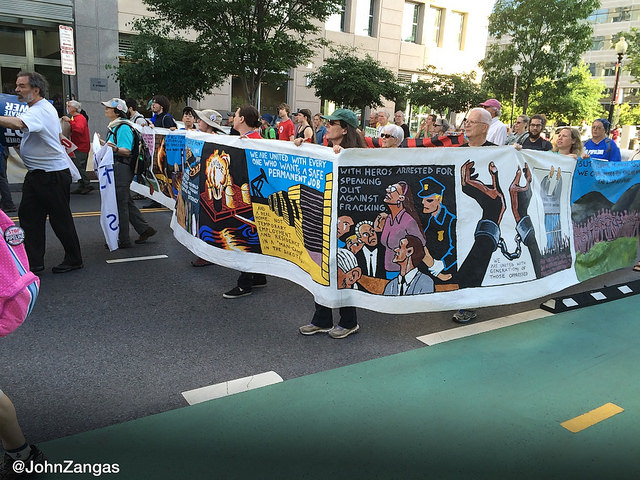 These actions mark the beginning of a week of action against FERC. 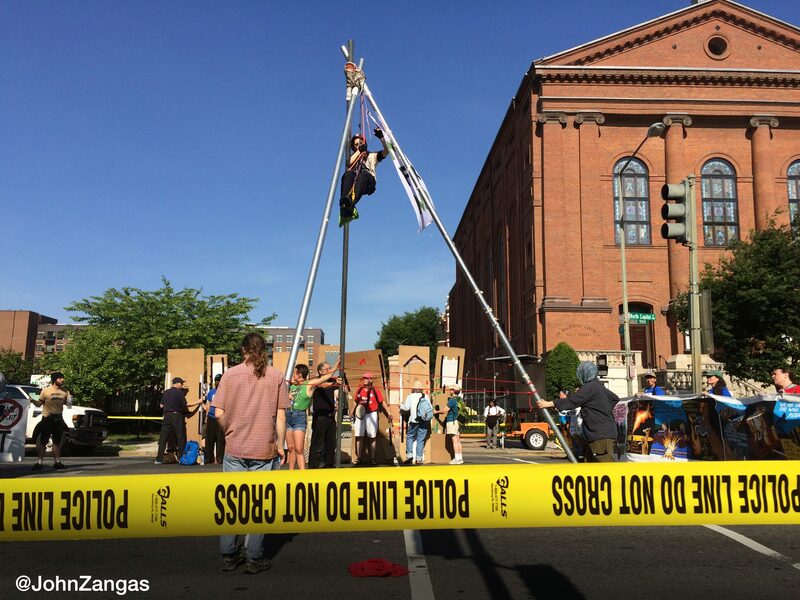 Organizers said that fracked gas is dirty, dangerous and a climate killer — despite the assurances of FERC and other government agencies. FERC is supposed to regulate the gas industry, yet it constantly approves dangerous fracked gas projects like interstate pipelines, compressor stations and liquefied natural gas (LNG) projects – ignoring the communities who are hurt by these projects’ devastating health, economic, environmental and climate impacts. 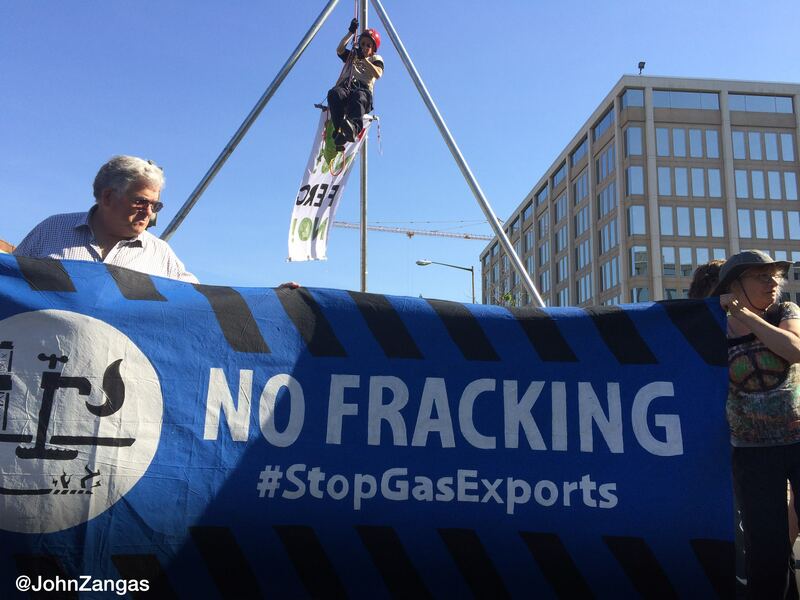 Tuesday’s protest featured people from towns impacted by Liquefied Natural Gas projects, such as Tracey Eno from Cove Point, Maryland. LNG is the easiest format to ship fracked gas internationally or domestically, and U.S. applications for LNG permits have been steadily rising over the last few years. Organizers plan to return tomorrow and shut FERC down again. “They’re paid by the fracking industry, never say no to a project, and frequently ignore their own rules. FERC is clearly trying to silence us and has labeled anyone who speaks out for people, the planet or the climate as a security threat. FERC isn’t a regulator, they’re a joke! So today, the joke is on them,” said Drew Hudson of Environmental Action. Groups participating in this week of action include Marcellus Outreach Butler, Environmental Action, Sane Energy Project, Chesapeake Climate Action Network, Stop the Minisink Compressor Station, 350 Loudoun, Flood Boston, No Fracked Gas in Mass, Rising Tide North America, Stop the Frack Attack, Southern Oregon Pipeline Awareness, Stop the Penn East Pipeline, Stop the Algonquin Pipeline Expansion, Bakken Pipeline Resistance, Friends of Nelson, and more. Tuesday’s “Stop the FERCus!” mobilization gathered communities that are part of a continental resistance movement opposing all liquefied natural gas (LNG) export projects like ones proposed in Lusby, MD, Coos Bay, OR, Rio Grande Valley, TX, Port Ambrose, NY, Squamish, BC, and many more. 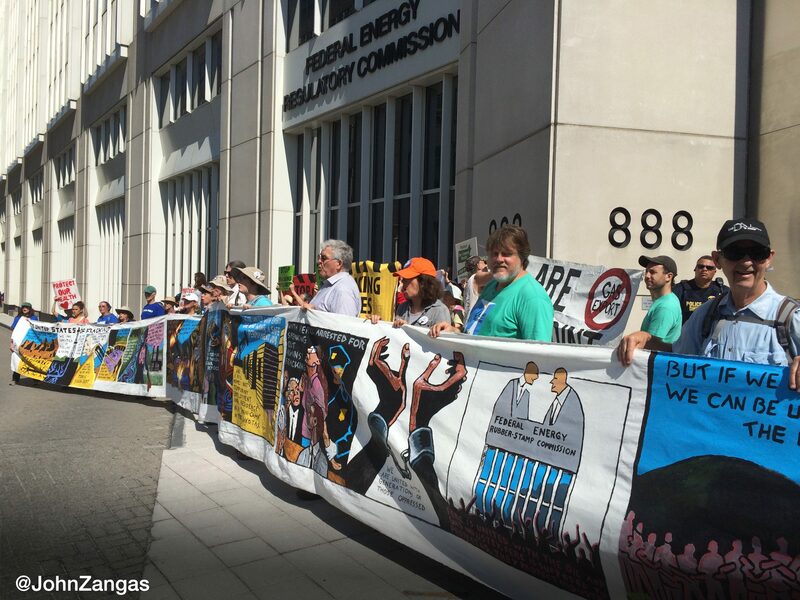 This week builds on Beyond Extreme Energy’s previous actions to shut down the Federal Energy Regulatory Commission; see below for photos from today’s actions. Photo credits to John Zangas of DC Media Group.